This pattern is available from etsy.com for £4.00. This shawl was created whilst watching my daughter’s gymnastics lessons and named after the parallel lines which create the pattern. 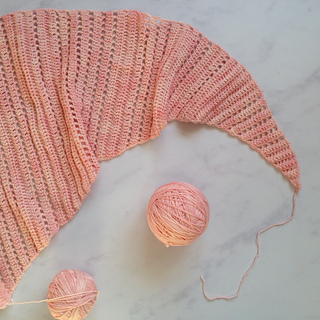 Simple to make, choose your favourite sock-weight yarn for this lovely shawl. The patterns are written in English and are available in UK and US terms. There are detailed photos to support the pattern. The finished shawl measures approx 150 x 37 cms. Feel free to make and sell finished items made from this pattern. However, you may not reproduce or sell the pattern itself. I just kindly ask that you credit me as the designer and that you link to my Etsy shop (www.etsy.com/uk/shop/AnnaboosHouse) if selling online. Once payment is received details of how to download your PDF pattern will be emailed to you. If you have any questions or queries about the pattern, then do contact me- I’m only too happy to help.